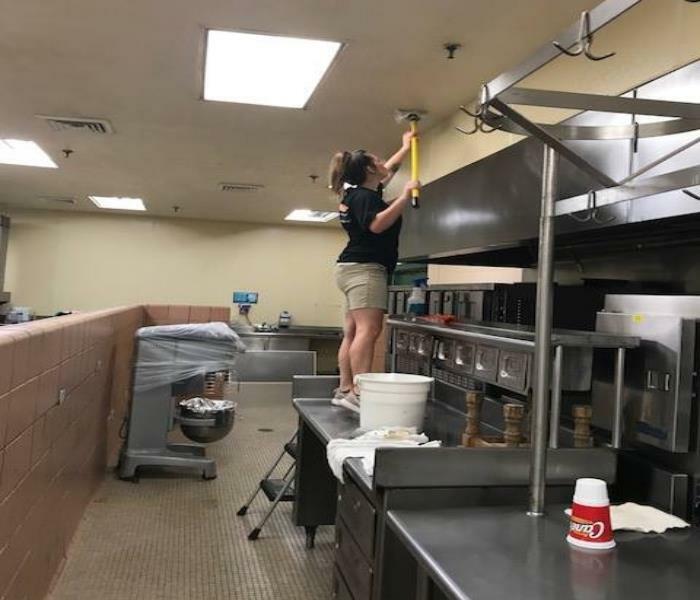 SERVPRO of East Baton Rouge crew cleaned the kitchens and cafeteria at North Iberville Elementary in preparation for the new school year. SERVPRO of East Baton Rouge offers commercial cleaning services for schools, hotels, property management, restaurants, and office buildings. Contact our office to schedule an appointment with our sales team. 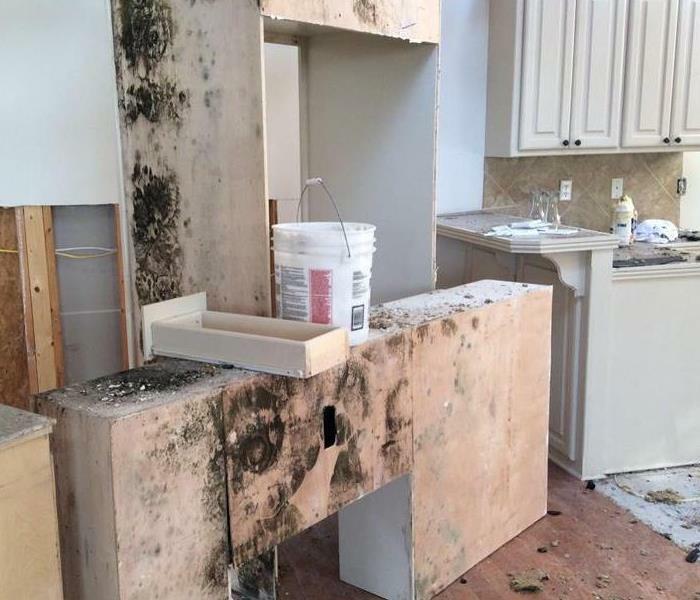 This East Baton Rouge home had extensive mold damage in the kitchen due to being exposed to high humidity temperatures over a long period of time. SERVPRO of East Baton Rouge was able to contain and clean up the mold for this customer. Pulling up the carpet in this East Baton Rouge home you can see that mold has grown and started to spread. 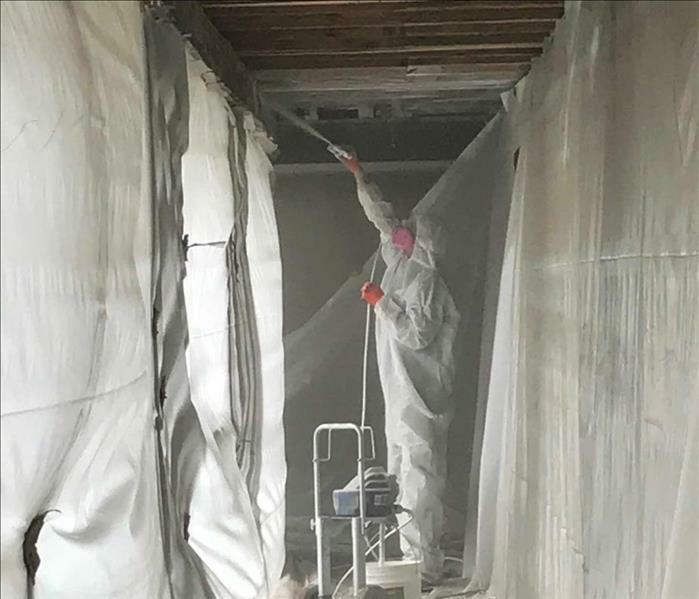 It is important to get a professional company that specializes in mold remediation to prevent further contamination of your East Baton Rouge home. What do you do when a fire or water disaster completely destroys your personal property? What is the process to follow to get you back to before the loss happened? Who do I contact? How many different people will be involved in restoring my property back? These are the questions that anyone who encounters a property loss due to fire, water, or storm has to endure. SERVPRO of East Baton has the national support to complete your loss reconstruction from beginning to end. The team of experts will make your loss situation less stressful and you will have the confidence knowing you are dealing with one company that can partner with your insurance company, complete the restoration, and finish the reconstruction to "Make It Like It Never Even Happened". 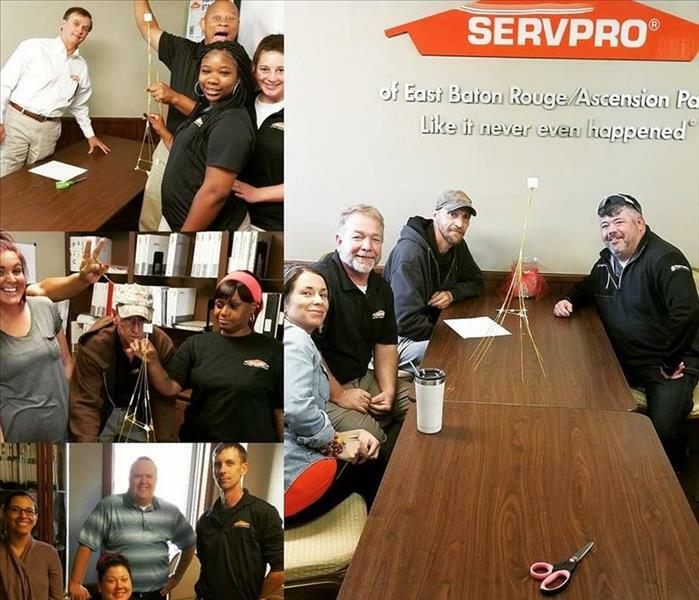 SERVPRO of East Rouge strive to always go the extra mile, to treat our customers like family, and to regard their belongings with the highest level of care. Pictured here are boxes of contents from a few of our customers' homes. All of the contents have been cleaned and deodorized. 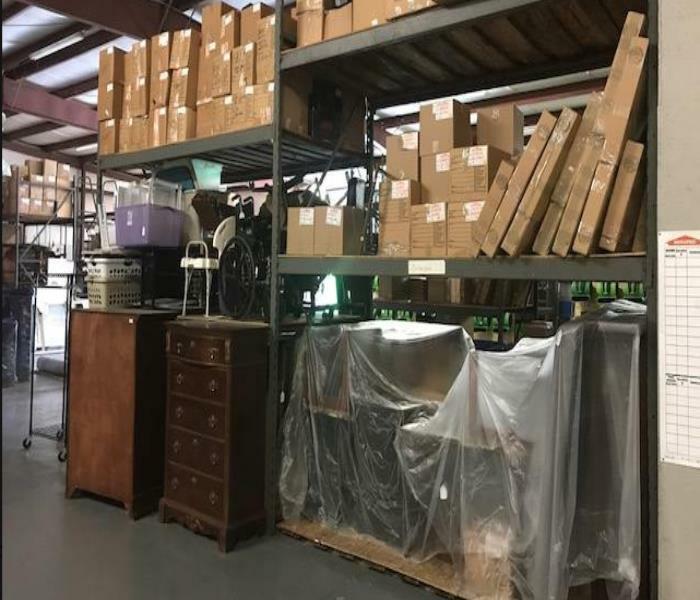 Now, they are being stored in our warehouse until the homes have been completely rebuilt and we can return them. Every extra step we take during the restoration process in intended to give our customers more peace of mind and to ensure a smooth recovery back to life as normal. Sometimes when our crews make it to water damages the simple extraction or removal is not an option. Our crews have to think outside the box to save our client's specialty wood flooring where applicable. At this particular damage our crew set up a tent over specialty hardwood flooring to assist in the drying. The customer was happy that we were able to save their hardwood flooring and get it properly dried out. When cold weather hits it can only mean one thing, busted water pipes. Luckily the team at SERVPRO of East Baton Rouge works 24/7 to take care of our clients. We get your business / home back up and running as quickly as possible. There is no task to big or to small for our team of water professionals to tackle. Our teams word tirelessly to put together a packet of your water damage to allow you to get payment from your insurance company quickly and without push back. We take care of our clients ensuring they have a great experience with SERVPRO. One of the hardest tasks our teams face when tackling a fire damage is smoke odor. SERVPRO uses special sealant to encapsulate the odors in the studs after cleaning. Presenting SERVPRO's Emergency Readiness Program to Keith Cooper of Nexion Helath at the Gonzales Healthcare Center. Thank you Keith for the partnership in our community. 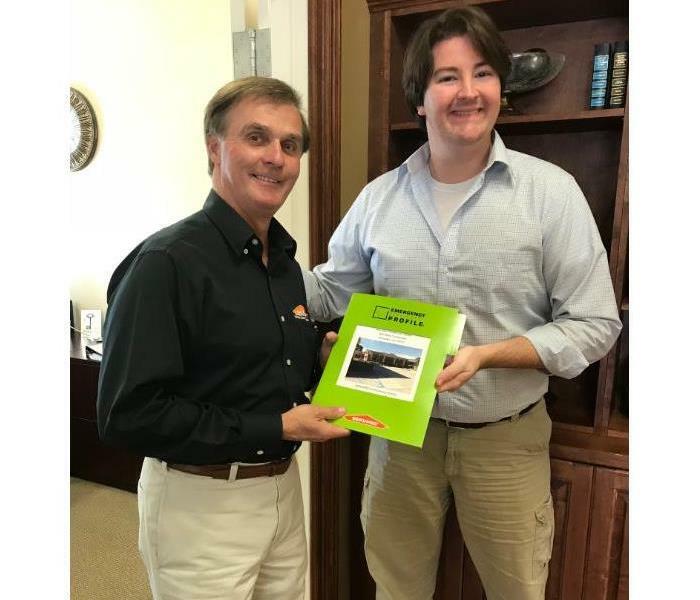 SERVPRO of East Baton Rouge continues to work with Industry professionals to establish lasting relationships. 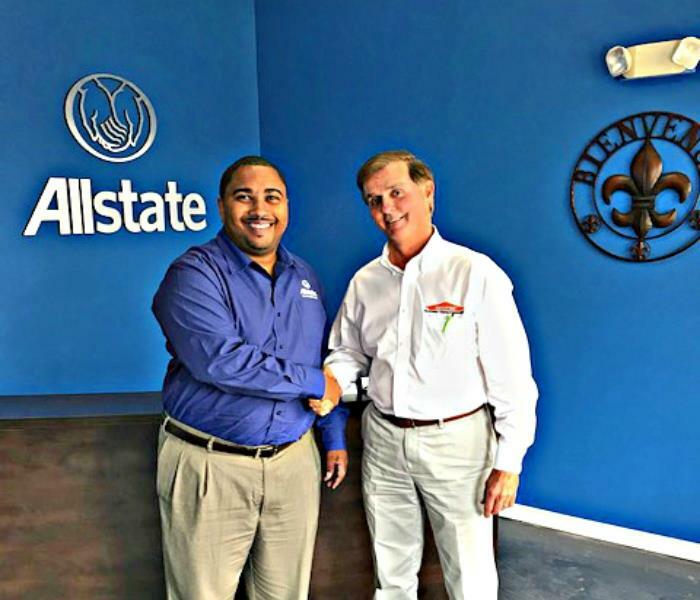 Thank you for the partnership John Riley with Allstate in Gonzales! 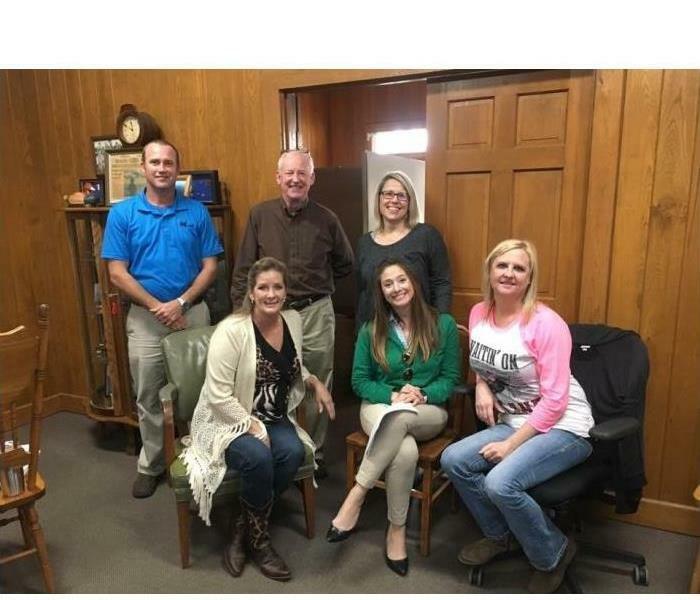 SERVPRO of East Baton Rouge establishes relationships with local agents from various insurance carriers. This allows us to give daily updates when projects are at their insured's home. It is important to know when to call a professional when it comes to mold damage. Extensive mold in the home can lead to numerous health affects if not taken care of immediately. Our crews were able to demo the wood flooring and wall to get this family on the road to a safe home. 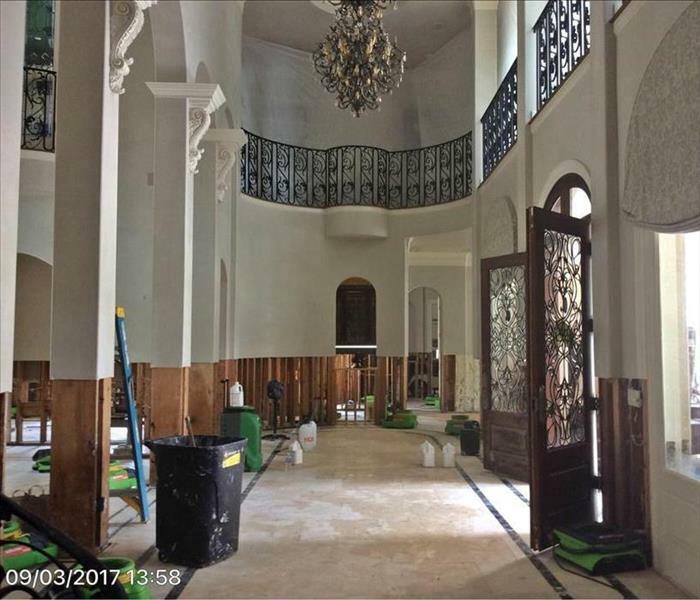 Hurricane Harvey created havoc on this home in Houston, Texas. A 4-foot cut had to be completed throughout the entire home. Category 3 Water Damage calls for everything to be removed due to the contaminants in the water. This home had over 100 air movers and 20 dehumidifiers and took up to 8 days to dry the entire structure. Our Storm team responded quickly when Hurricane Harvey caused catastrophic damage in Houston. This home had to be gutted up to 4 feet in order to remove all saturated materials with Category 3 water. The air movers were in place for three days and monitored daily in order to determine if the structure was drying. 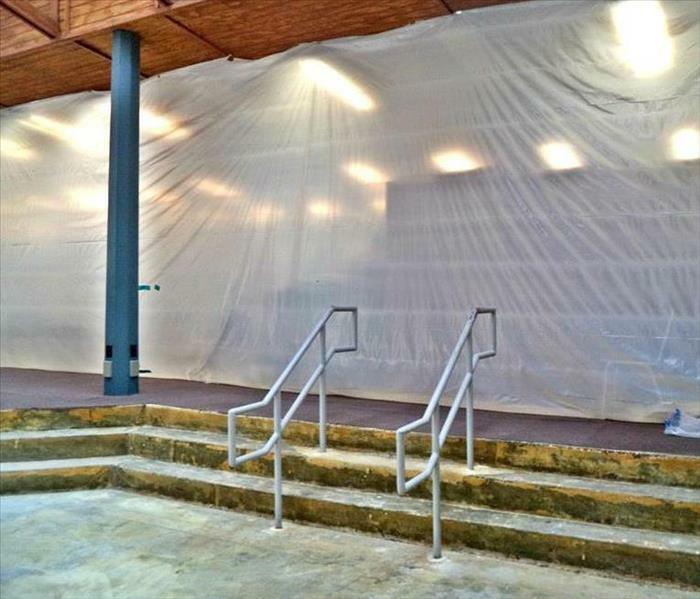 Containment is one of the most important assets to a successful mold remediation project. Containment not only helps air scrubbers clean the air but it also quarantines the affected room from the remainder of the building. This stops mold spores from being transferred through the air system while remediation is taking place. Depending on the severity of mold a sealant may be used to encapsulate any contaminants that could not have been removed from materials. Mold sealant is a paint-like substance designed to seal a moldy surface from which the mold cannot be fully removed, like wood. Encapsulating mold in this way is generally only done when the moldy material cannot be removed and replaced. Most of the time, it’s better to remove the moldy material if it cannot be adequately cleaned. This is the aftermath of the outdoor of an apartment unit after the kitchen caught fire. This is an illustration of how smoke moves throughout the building. The two main factors that determine the behavior of smoke is the temperature of the smoke and the temperature of the surrounding area. That is why the SERVPRO fire restoration team tests all rooms with a clean sponge to determine the extent of the smoke throughout the home. 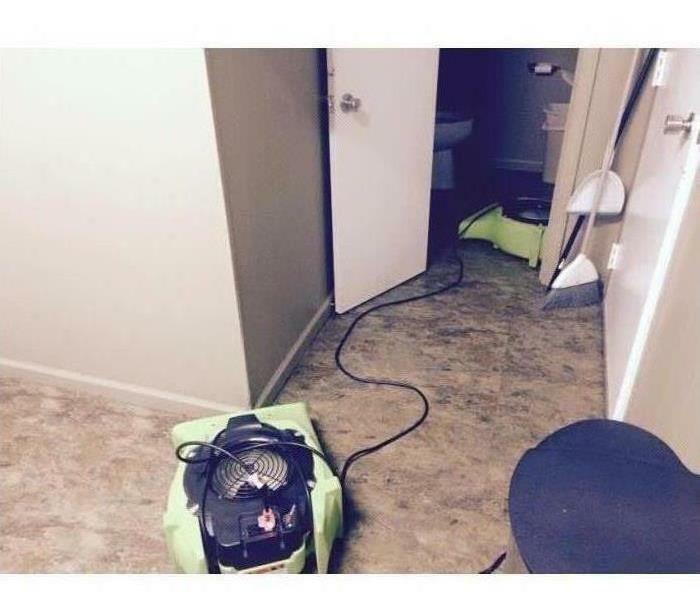 This was the aftermath of water damage caused by a roof leak in Baton Rouge, LA. There was significant damage to the kitchen cabinets. 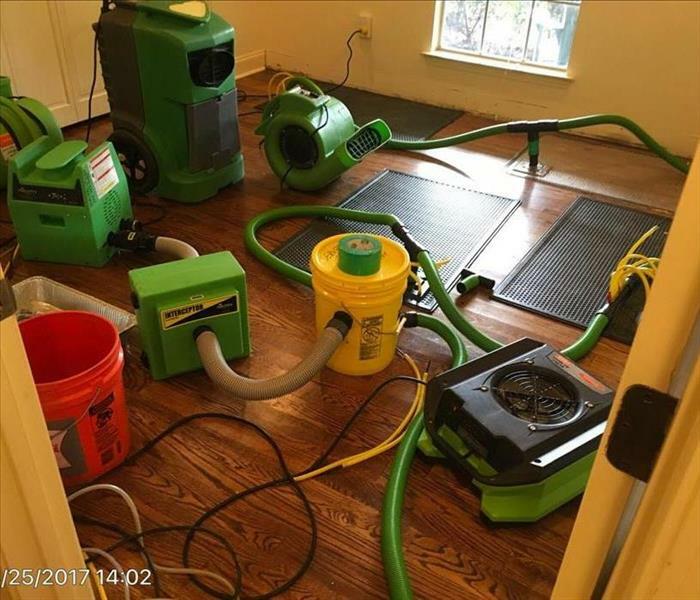 We used SERVPRO's Injectidry system to ensure our jobs were able to dry our client's home to preloss condition. We make disasters "Like it never even happened." 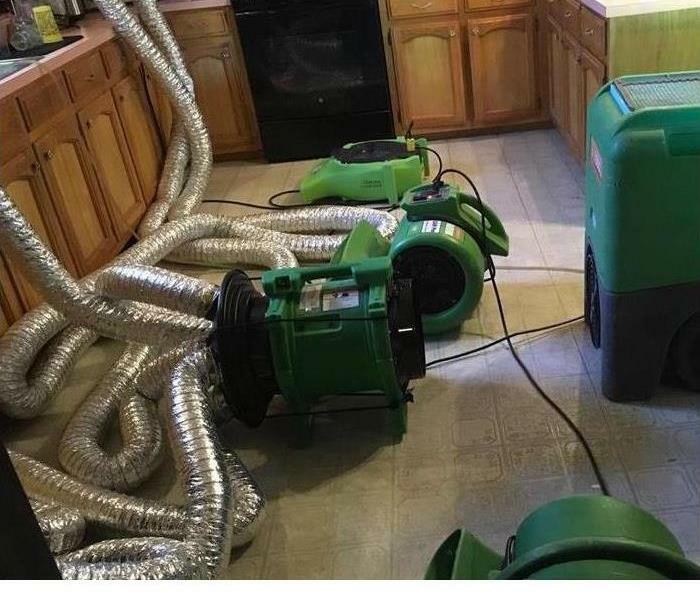 When it comes to drying a home after a water damage the SERVPRO water remediation team does what it takes to get your home back to dry. 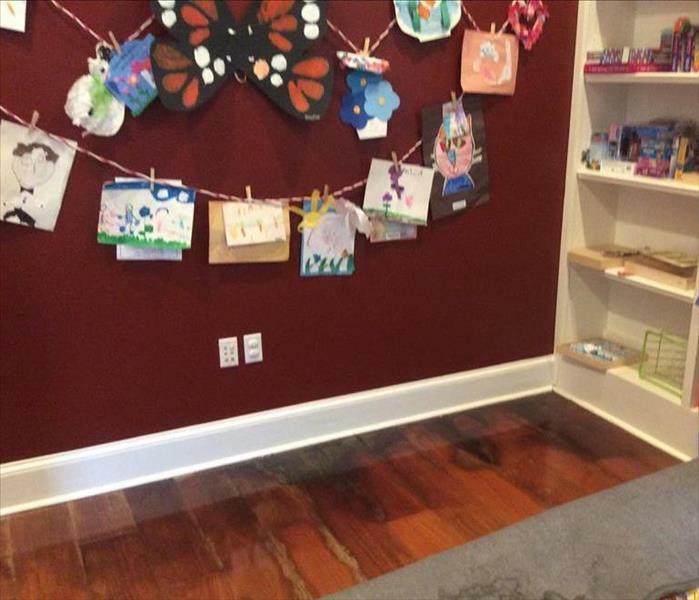 Our floor drying system assists in drying hardwood floors. It creates a vacuum seal on mats that moves air from the sub floor to the surface. 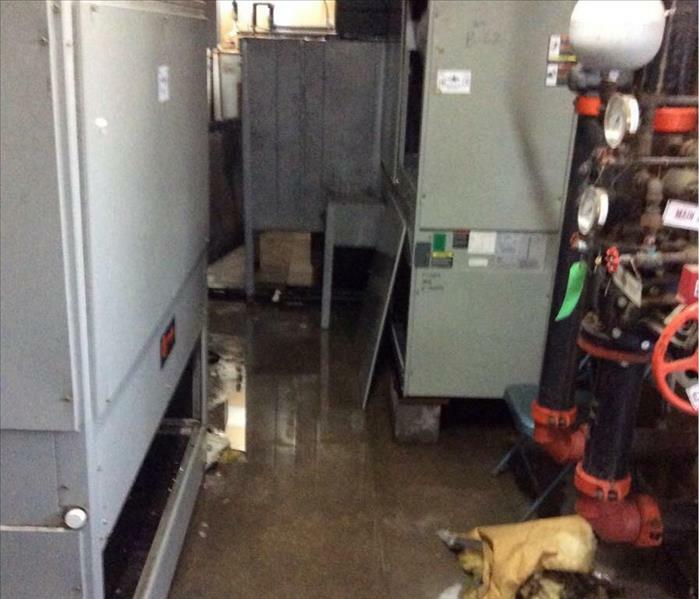 During water remediation at a business in Houston our crews noticed a mold issue that has been present for a while. In order to remove contaminants from the air our team set up several HEPA systems. These systems can be used as either negative air fans or air scrubbers. After running for several days the environment had been stabilized and completed. Contact SERVPRO of East Baton Rouge today at 225-753-3434! 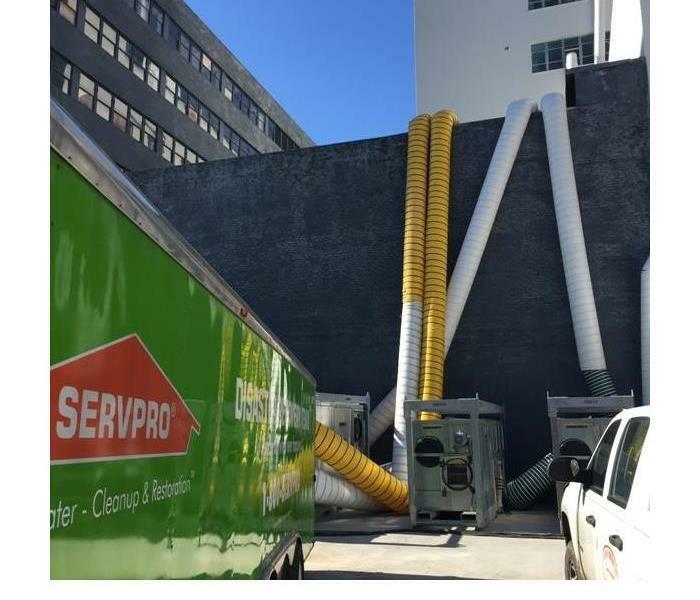 Commercial Duct Cleaning at this local business helped improve the indoor air quality of their office. Some additional benefits of servicing your business's HVAC unit is to restore peak energy efficiency, eliminate offensive odors and rescues the potential for mold growth. This is the primary area of damage when this homeowner's AC pain overflowed. This caused the ceiling to fall through and insulation to go everywhere. Notice the saturation of the carpet throughout this room and the closet. Our teams arrived and within hours of the initial time of loss and started the drying process of this home. 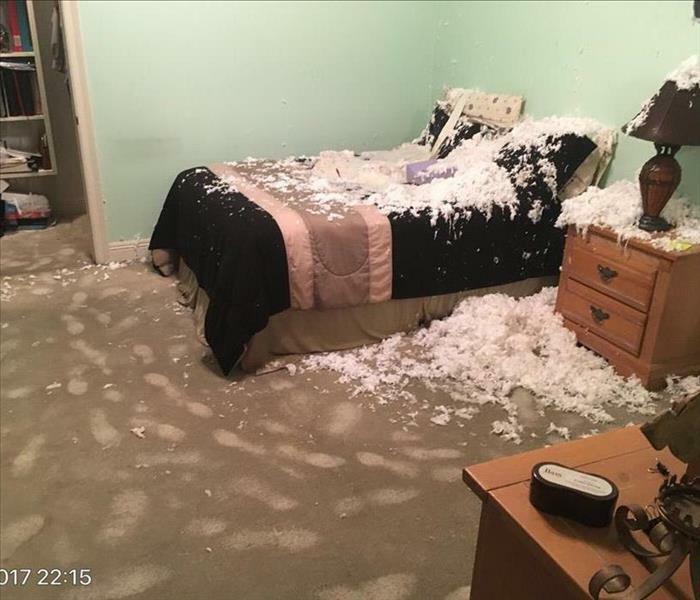 This was the aftermath of a candle fire in the living room of a home in Baton Rouge, LA. As fire restoration specialists, we have the training, experience and specialized equipment necessary to restore your home or business. 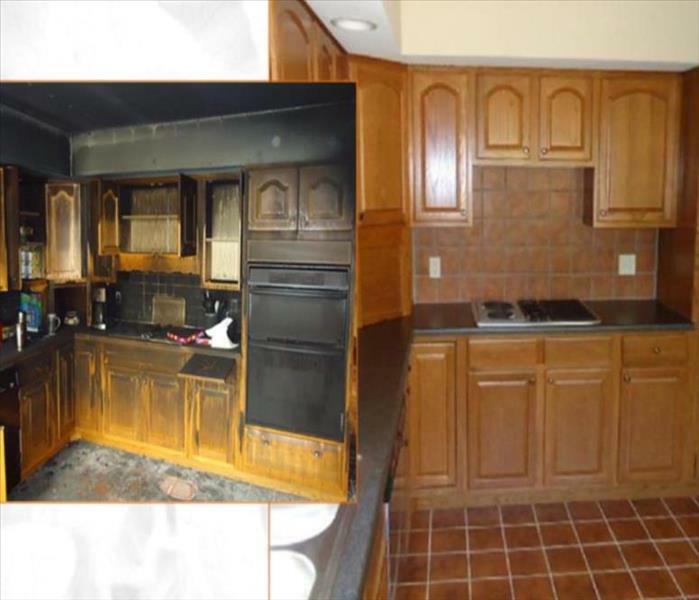 We are committed to providing superior service while restoring your property back to pre-fire condition. 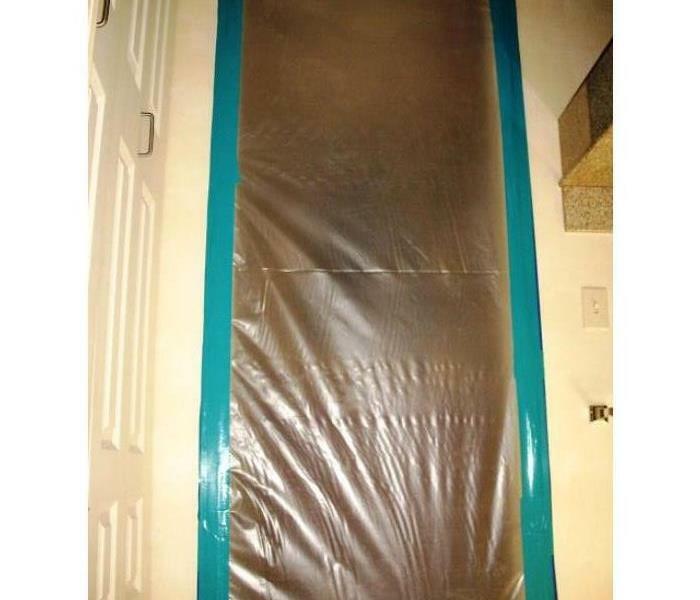 Containment is one of the most important steps to a successful mold remediation. Various containment procedures will be placed to prevent the spread of mold and isolate the contaminated area with physical barriers and negative air pressure to keep the mold spores from spreading during the cleanup. 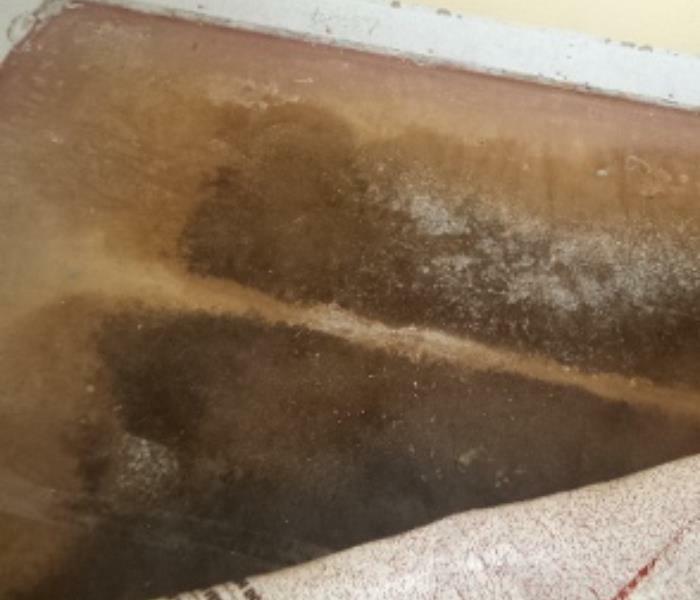 This mold remediation project was caused from a leaking water pipe behind the bathtub. SERVPRO Disaster Recovery Team is ready to take action when the largest storms and the highest flood waters hit. With a network of 1700 Franchises, SERVPRO is faster to any size disaster, and the Disaster Recovery Team is a major reason why. SERVPRO of East Baton Rouge is your local SERVPRO Disaster Recovery Team. SERVPRO of East Baton Rouge is Ready for Whatever Happens! 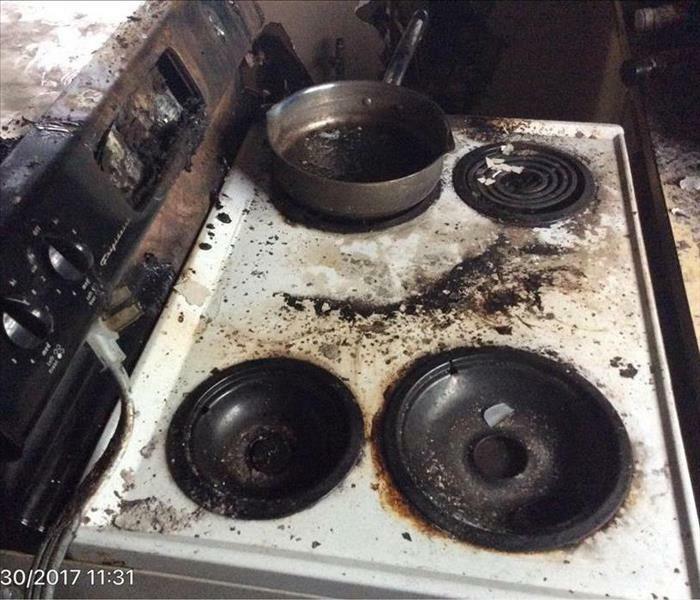 This was the cause of loss of a kitchen fire in Baton Rouge, LA. The soot in the kitchen called for several rooms of complete demolition. Since this fire started in the kitchen there was heavy protein residue throughout the home. In most of these cases the entire home may require cleaning to eliminate the greasy protein residues and the odors associated with it. This is the aftermath of participating in the Continuing Education Courses. These CE courses are offered for our insurance professionals in Baton Rouge. Wide range of CE classes are offered; 2 hr credit courses up to 4 hr credit courses. If you are interested in learning more about our CE Courses, you can call SERVPRO of East Baton Rouge at 225-753-3434. 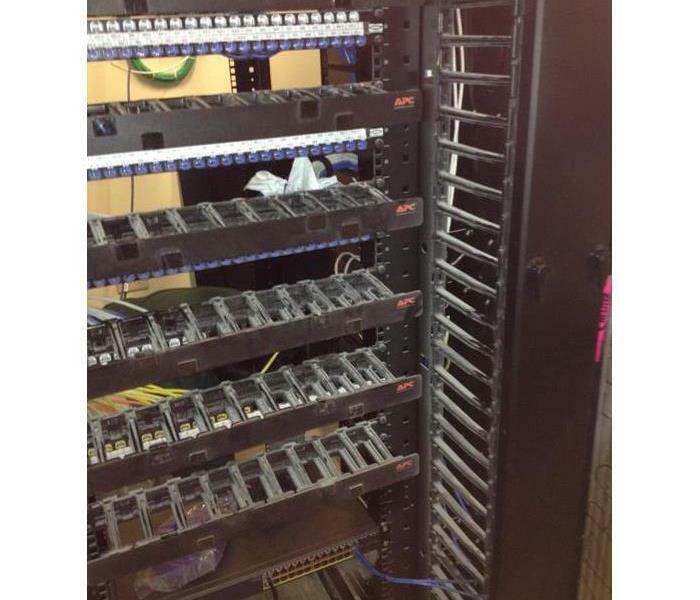 This is the aftermath of an IT Room located inside a building under construction in Baton Rouge. When we arrived on-site, there was heavy saw dust covering data towers and equipment. The IT director couldn't believe how quickly and completely we were able to clean the saw dust from the walls, ceiling, vents, and equipment. We make it "Like it never even happened." 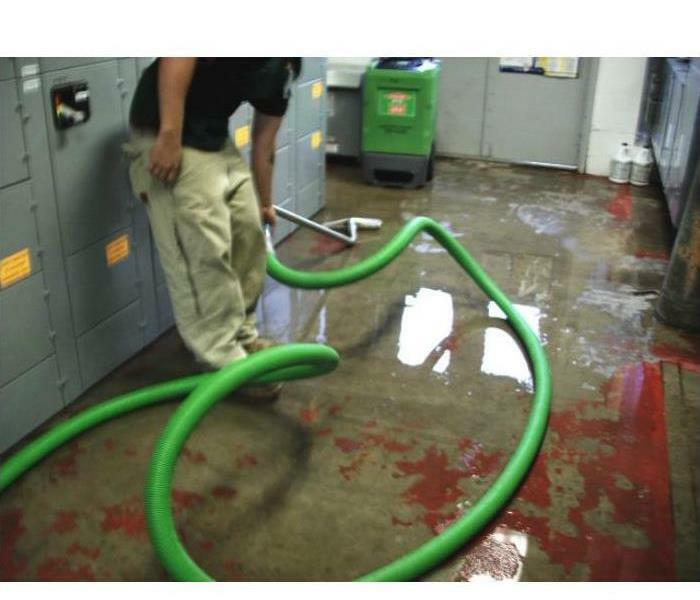 In the event of a large commercial water loss SERVPRO of East Baton Rouge know the most effective method of removing moisture from the structure is extraction. Our Commercial Loss Teams are equipped with Extractors that are either truck-mounted or portable allowing for greater access inside your building to get your facility to return back to normal business as quickly as possible. This is the aftermath of an electrical fire at a school when we arrived on the scene. There was significant smoke and soot damage. The staff couldn't believe how quickly and completely we were able to clean the soot from the walls and ceiling. We make disasters "Like it never even happened." This was the site of a high rise commercial water damage in Baton Rouge. During the renovation of the building, a pipe broke causing 6 floors to flood. 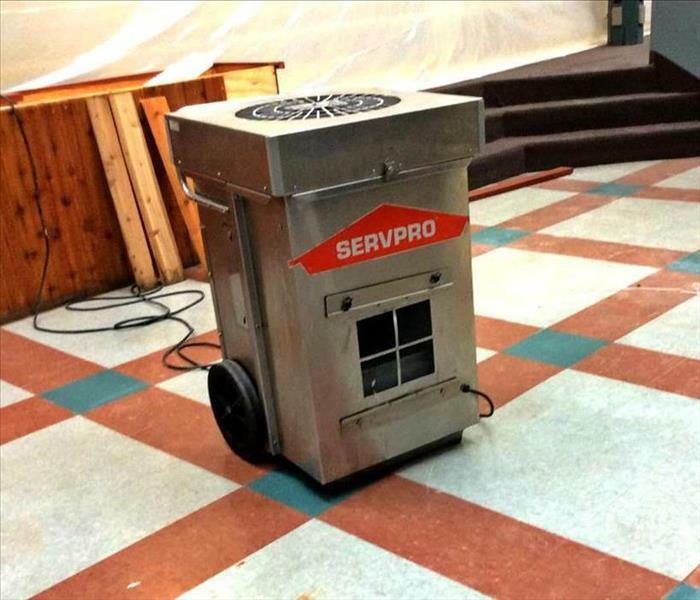 The owner was impressed by the immediate emergency response by the SERVPRO of East Baton Rouge professionals. We make disasters "Like it never even happened." 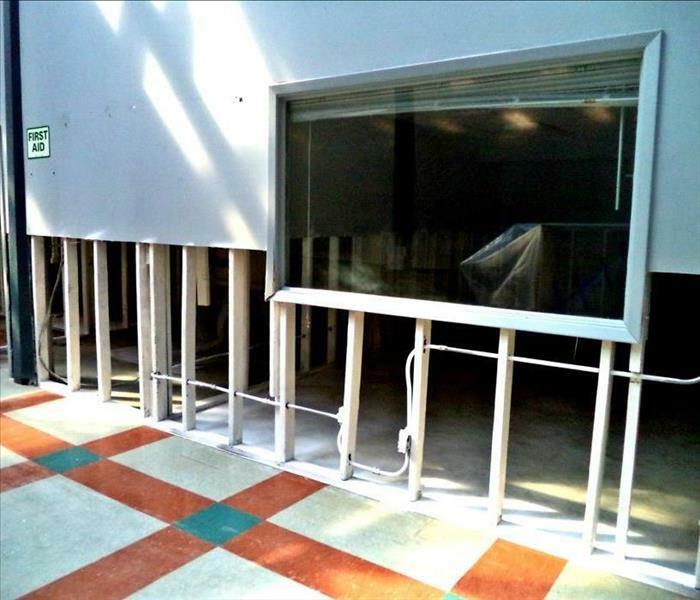 This was the aftermath of a water damage at our office in Baton Rouge. 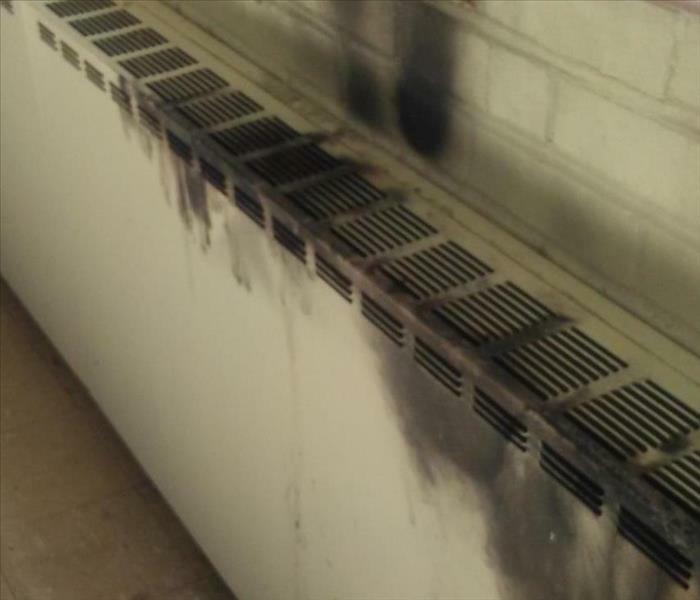 The HVAC drip pan overflowed causing water damage in 3 areas of the office. Luckily, our team of professionals knew exactly what to do. 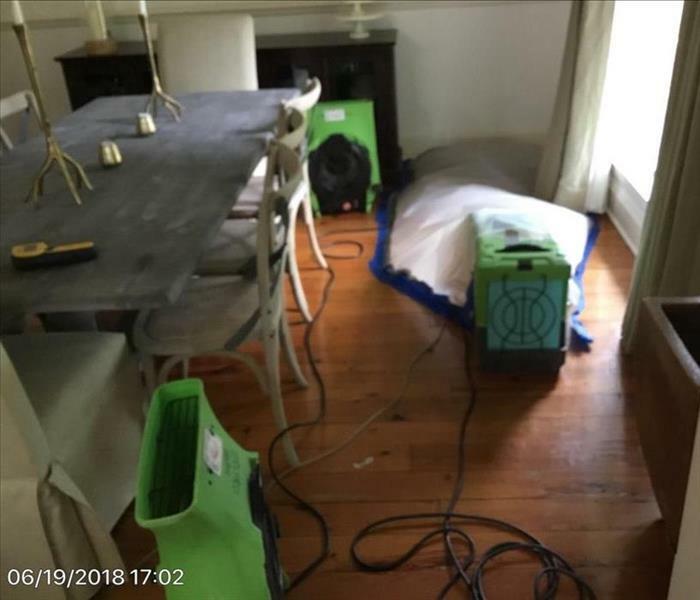 Whatever the size, you can count on the professionals at SERVPRO of East Baton Rouge to respond quicker to any size disaster. 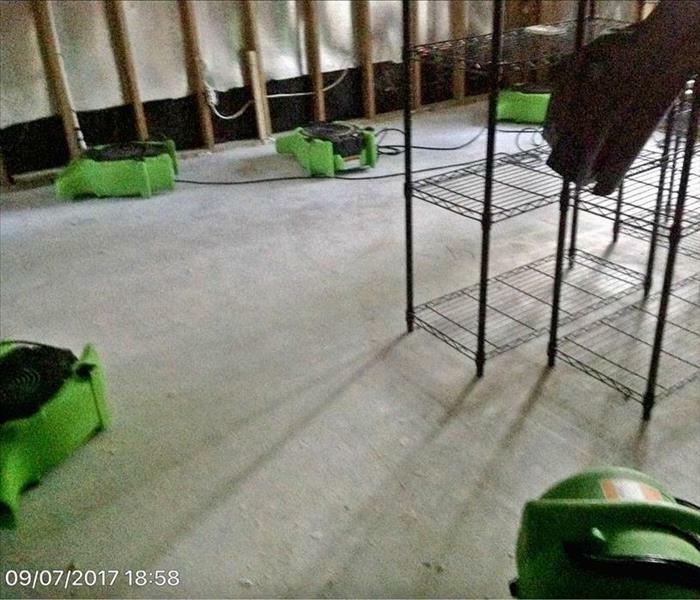 The SERVPRO of East Baton Rouge Storm Response team was onsite and ready to assist this local agency after Hurricane Isaac caused widespread water damage to their building in 2012. Our teams made it "Like it never even happened."